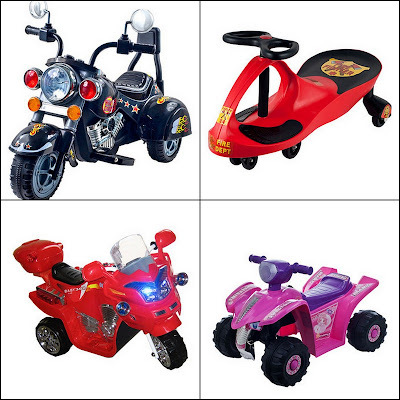 Great deal on electric motorcycles and 4-wheelers for kids! My daughter's birthday is coming up in a few months so when I saw this deal on Zulily (one of my favorite daily deal sites) I had to go for it. It's PERFECT for toddlers, and is a gift that all my kids can enjoy…plus, I had enough store credit saved up that I only had to pay $8 for it! 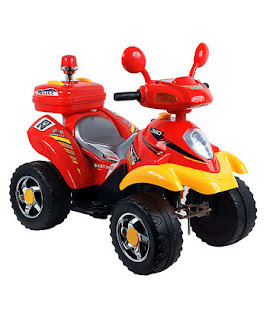 I went with THIS ONE (above) because I figured it'd be easy even for little kids to ride. The wiggle car (top right) is awesome. We have two of them (bought one at a yard sale for $4!) and they are hands-down my kids favorite ride toys. I like them because even I can ride on those along with my kids. Anyway, they are only $29 which is a good deal – I bought mine for $35 and thought THAT was a good deal, so $29 is awesome. Anyway, I know these toys are on the expensive side and don't necessarily fit within my recommended gift budget (but it does fit within the Christmas budget). However, if it's your kid's birthday I think one “big” gift is just fine…and might as well get a good deal on it! So there you go, thought I'd pass along the deal I found. Click HERE to check them out! And remember, when you sign up for Zulily you get your own link. You can earn store credit by sharing the link with friends/family so if you do that you might even be able to get some fun things for cheap or even free, just like I did!